Club world Casino is an online gambling site that gives a gamer the option of downloading the gaming software of playing the games online. It boasts a selection of 120 games for a gamer to choose from meaning that you will always have the game of your choice at Club World Casino and also get the option to pick another game should you decide to. 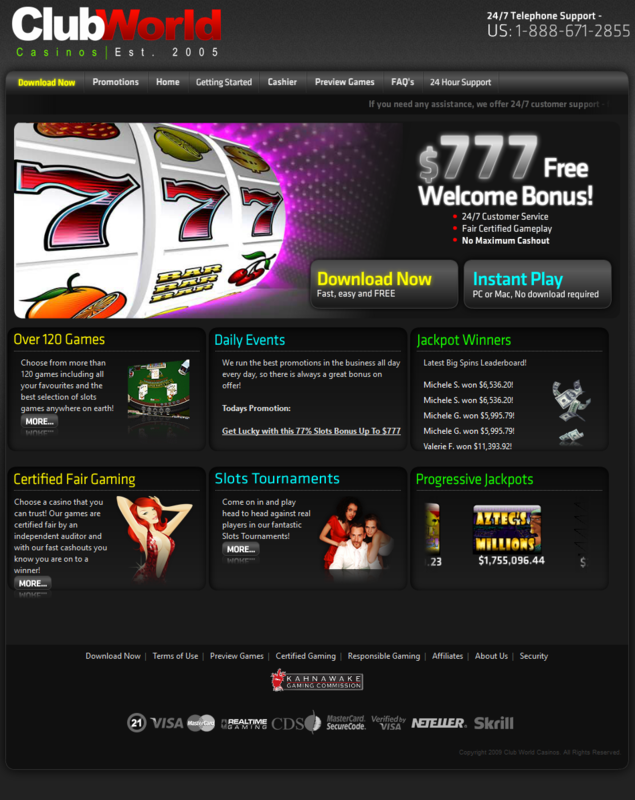 The site offers a number of promotions including their most famous $777 welcome bonus so you will never have any problems being convinced that you should pick Club World Casino above all the other gaming sites in the market. In addition to their numerous promotions and wondrous bonuses, Club World Casino offers 24 hour support to all of those who are new to online gaming as well as a detailed getting started guide for new gamers. Club World Casino, works to ensure that you get the best gaming experience that they can provide. Club world Casino has a wide selection of the 120 casino games under a number of categories. These games include video slots that give you a graphical, incredible gaming experience. These video slot games include food fight, jazz time, the shark, shopping spree among many other perfectly done video slot games. There are also a number of Reel games which are done just as exquisitely as the video slots; they include Bank on it, Bonkers, Triple 7Inferno, Sevens and Stripes among very many others. They also have the classic Bonus 3 Reel, Real Series A-C, and Real Series D-G among many other reel games that are bound to make your gaming experience at Club World Casino a memorable one. Other games include several variations of Video Poker and a number of progressives as well as table and specialty games. At Club World Casino, you are offered a variety of methods to deposit and withdraw money into your account. Some of these methods will allow you to instantly deposit money into your account. These deposit methods include credit card, Instadebit, Eco Card, Click2Pay. NETeller and Skrill. You can also withdraw money directly via all of those deposit methods except for a credit card withdrawal which takes up to 4 days to complete. Additionally, you can also withdraw via bank transfer, courier check or wire transfer all of which take 5 days to complete. 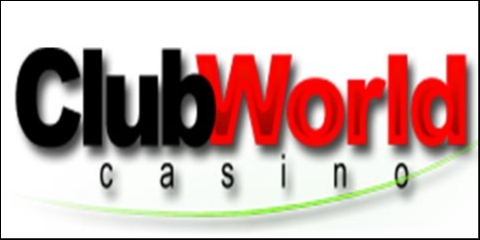 Club World Casino also endeavor to ensure that your deposit and withdrawal is seamless and smooth but all players at Club World Casino must provide proof of age before they are required to make any withdrawals and the withdrawal limit is $4000 per week and any cash withdrawals that are larger than the limit will be paid out in weekly installments. Apart from the amazing welcome bonus that a first time client gets at Club World Casino, there are a number of other promotions that you can take part in at Club World Casino that will make your gaming experience that much fun. There are regularly organized daily promotions that will enable you to have a coupon code that you can use to get a percentage bonus for the game that is being promoted. As a gamer at Club World Casino, would only need to regularly check the promotions page to see what daily promotions they can take part in. there are also a number of featured promotions that a gamer can be a part of at Club World Casino. One of these feature casino promotions is Crack the code where if a gamer can guess the 6 letter combination to their safe, could walk away with a $10,000 grand prize. The many promotions and games available at the Club World Casino make the site a gamers’ paradise, Not to mention the beginner’s guide for all those who are just starting out in the world of online casino gaming. They also take a number of measures to ensure responsible gambling. I always played Topgame slots but one day I found club world with its nice real time gaming games. 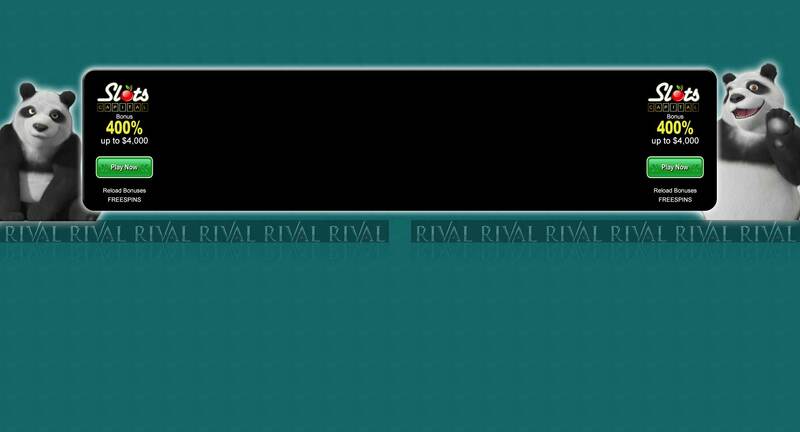 Wow, when I was a beginner to online casinos I always played topgame slots and these slots are so sick. Do it like me and join a rtg casino. When it comes to bonuses club world has a lot to offer and when it comes to payouts you should be patient. Patiently waiting you will receive your money, but it will took some days. As a first time big winner I needed to verify my account and this alone needed a full week. Five working days later I was paid within again two weeks.